Because of the importance of Gold’s Gym in Venice to the birth of bodybuilding, the Golden Era has always been associated with Southern California beach life. But you can enjoy hot weather workouts wherever you live. Here’s how to get the most out of “sun’s out, guns out” training. If you’ve followed the careers of the Golden Era icons, you know that they loved taking their act outdoors in the hot summer sun. You’ve probably seen the famous photos of legendary greats like Dave Draper running on sandy beaches, or Franco Columbu and Arnold Schwarzenegger shirtless and grinning on the Venice Boardwalk. The carefree summer vibe was part of the appeal of the Golden Era. It’s why Muscle Beach will always be a central part of the bodybuilding experience. Variety—Exercising in the summer sun gives your workouts the variety you may sorely need. Doing the same thing in the same environment, day in and day out, can sap your motivation and stop you from progressing. Working out outdoors will help inspire you to conquer your fitness goals. Sometimes, all it takes is a change of scenery. Cost and convenience—When the world is your gym, you can improvise training routines in parks, beaches, and even your backyard on your own time at no cost. Of course, make sure you use sun lotion protection to prevent sunburn (SPF 30 or above if you have fair skin). Party Atmosphere—Exercising outdoors also allows you to spend quality time with your friends and family. While you’re at it, you may also meet other fitness enthusiasts when you enjoy an outdoor sport, or train in an outdoor gym. Traditional strength-training exercises –If you have access to an outdoor gym with free weights, go for it. The Golden Era greats enjoyed the heat of the sun and the cool of soothing beach breezes as they lifted. You will too. Dips—You can perform these using a park bench, an outdoor jungle gym, or even a playground slide. The possibilities are endless. Assume the standard dip position and make sure your upper arms are parallel to the ground. Lower your body as far as it can go (make sure to feel the sensation in your triceps and/or chest). Repeat to the desired number of reps.
Explosive Pull–Ups—This is a classic Golden Era exercise which works biceps, shoulders, and back. Find a chin-up bar or parallel bar in your local park. Hold on to the bar with a slightly-wider-than-shoulder-width grip. Make sure your body is perpendicular to the ground. Lift your body up in one explosive motion—try to make your chest touch the bar, if possible. Repeat for the desired number of reps.
Yoga—Try enhancing your yoga experience by doing it outdoors. Performing your downward dog, warrior 1, and other yoga positions while communing with nature will help lower stress levels like never before. Who knows? You may inspire other individuals to follow suit. Stand-Up Paddle Boarding—Yes, it’s harder than it looks. Stand-up paddle boarding helps improve balance and heart health, while exercising the entire body. It’s one hot-weather exercise that has great all-around health benefits. Rowing—Kayaking, canoeing, and other types of rowing are terrific exercises, as you know if you’ve used a rowing machine in your gym. Rowing helps increase aerobic endurance, while working your upper body. Beach Sprints—A bit of a Golden Era touch to your workouts with beach sprints. 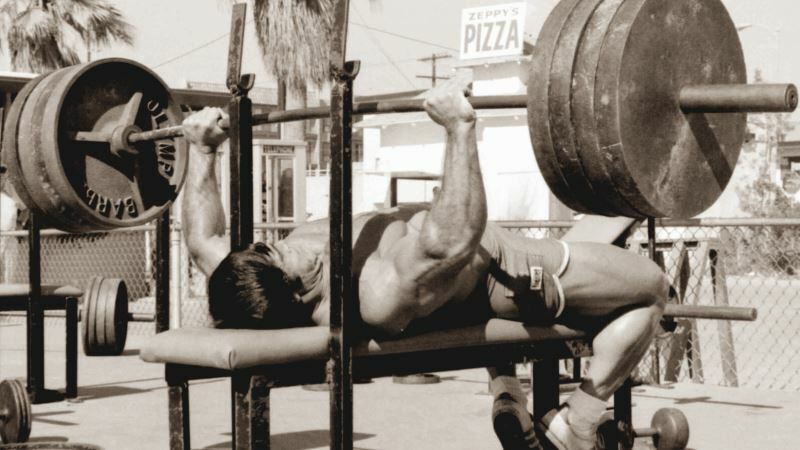 Many old school legends would run the shores of Venice Beach for 15-20 minutes after their strength-training sessions. Case in point: Golden Era icon Casey Viator loved to sprint outdoors as part of his training regimen. Monkey Bars – If you thought doing monkey bar exercises is a kiddie thing, think again (don’t forget the Marines are monkey bar experts!). Even the original Muscle Beach in Santa Monica was a collection of rings and monkey bars. Take advantage. The varieties of exercises on bars and rings can help build grip strength, forearms, lats, deltoids, and biceps. Among the monkey bar varieties you can try are basic, skip-a-bar, weaving, “skin the cat,” side swing, typewriter, and pull-ups. You can also use the monkey bars to do hanging core/abs exercises. Swimming—This exercise is about old school as it gets. Whether you choose to swim in an outdoor pool or a natural body of water, you should never miss out on the important benefits of this full-body workout. Bicycling–If you’re an indoor biking enthusiast, try taking your act outdoors for a change of scenery. Whether you choose to go biking by yourself or with a group, cycling is a great overall cardiovascular exercise that helps condition the legs. Hill or stair sprints –If you want to kick things up a notch, try doing hill sprints—an outdoor version of your incline treadmill workout at the gym. Hill sprints help you generate high leg turnover; increase power and stride length; improve heart health; and increase endurance. Finding a challenging set of outdoors stairs is another popular workout by beach bodybuilders. Your legs will be sore for days! You may have more hot-weather outdoor workouts in mind for the summer, such as beach volleyball or surfing. Whatever you do, have fun and enjoy the variety available to you. After all, isn’t that what it’s all about? If you’re having fun, you’ll become more consistent and disciplined with your training, and consistency and discipline breed excellent results. A word of caution: Make sure you don’t overdo it in the heat. Make sure you have your doctor’s approval for vigorous physical activity, wear sunscreen, and stay properly hydrated. Thirst is a poor indicator of your need for fluids, so keep a bottle of water with you at all times and drink regularly. Water is usually the best choice for hydration, however, there are instances when sports drinks or water fortified with electrolytes may be beneficial. What’s your favorite outdoor summer workout? Let us know in the comments below.